On December 14, 2011, at the initiative of Mayor Matteo Renzi, the City of Florence, Italy, decided to suspend all commercial activity for ten minutes as a protest against racism. Shop owners closed their stores for the entire day in solidarity. The catalyst for these actions? A tragic event that took place in the day before. 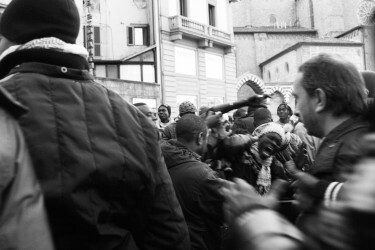 On December 13, Gianluca Casseri, a 50 year-old hunter, far-right activist and author of books denying the Holocaust, opened fired on a group of Senegalese in two outdoor markets in Florence. The horrific event resulted in the death of two street vendors from Senegal, as well as the perpetrator of the crime, who committed suicide after a brief shoot-out with police. The incident also left three other Africans injured and hospitalized in critical condition. According to reports of the incident published in the media, the incident created chaos and fear in the very heart of Florence. It also provoked vehement reactions and speculation as to the motives behind Casseri's killing of two strangers. Was this a case of racism or insanity? A video reviews the homicide and provides one Senegalese man's reactions; in his opinion, this was a case of racism. The video also features comments from members of a far-right group called Casapound, which counted Casseri among its enthusiasts. The day after the Florence massacre, flowers and candles marked the spot where two Senegalese street vendors were killed. Right there, where every day, from eight o'clock in the morning until late at night, Modou Samb and Mor Diop had their own booth; killed by the racial hatred of fifty-something Gianluca Casseri from the town of Pistoia, known for his far-right tendencies and belief in the purity of the white race. What happened is horrible, but the immigrant situation in Italy is becoming unbearable. This event is attributed to a fanatic, as an isolated incident, but in a few years, such events may not be perpetrated only by demented individuals. We Italians are continuously forced to make sacrifices, cut back on our lifestyle, our riches, freedom; our children can't find work, and here are these immigrants that come to our country to do whatever they please in total impunity, in broad daylight; ”the poor have a right to eat too” is what you hear from the usual do-gooders. But when we'll have become as poor as them, and if things continue to deteriorate, it won't take long before a full-out war is declared between people of the poorer class, and I have no idea how it will all finish. Badly, I'm sure. Funny that you miss the major difference between the two events: The CRAZY MAN in Belgium fired on an anonymous crowd, the RACIAL MANIAC in Florence ONLY fired on people with dark skin. I don't think so…poor people…but the only thing his brain told him was that violence is the way out of ignorance and a mentally depressive state. TRY LIVING IN AN IMMIGRANT'S SHOES IN ITALY FOR JUST ONE MONTH and then we'll see whose side you're on. Or maybe you think that because you were born as “one of the planet's lucky” you have more rights or feelings then the less-lucky? The death in Florence of Samb and Diop reminded me of the massacre of young Africans in Castelvolturno three years ago. I also remember, as if it were yesterday, the death of Jarry Masslo in Villa Literno in 1989 and the Pescopagano massacre in 1990… Italy is the leading European country when it comes to massacring Africans and that should make us stop and think. Chiara Barisson, an Italian sociologist based in Senegal, handed out 200 flyers in the streets of Sandaga as a way of offering her condolences and apologies, not only to the families of the victims killed in Florence, but to the Senegalese people as a whole. Surrounded by her Italian friends, she insisted on saying “I'm sorry” for the racist act, said The Observateur. Shop owners were said to be very touched by the sociologist's gesture. This event will take place simultaneously in many cities as an opportunity to renew discussions of the problems currently encountered by the migrant communities of Italy, “the need for a new amnesty, the resolution of problems of corruption, the refusal to create a points system for workers’ permits, the right to vote and to citizenship for the children of immigrants, the answer to the question of who was fighting in Libya and the request to shut down and stop using prisons as concentration camps.” This event is also the perfect opportunity to pave the way for March 1, 2012 and the foreigners’ strike. After Milan, protests are scheduled to take place in Caltagirone, Messine, Florence, Rome, Imola, Legnano and Cinisello Balsamo, in front of CARA di Mineo (CT). Thousands of people turned out last Saturday in Florence in protest at the action of a far-right activitst who killed two street vendors of Senegalese origin last Tuesday. Senegalese men killed in Florence: protest against racism — At least 10,000 people marched last Saturday in protest against racism in Florence (centre) where a far-right activist shot and killed two street vendors of Senegalese origin last Tuesday, injuring three others. We want to ring in a new era of hope, so that our two brothers didn't die for nothing, a spokesperson from the Senegalese community, Mr. Pape Diaw, declared to the press. We must work harder for peaceful coexistence and respect. It has to become a real battle, and not just a façade, he added. The number of protesters was estimated to be about 10,000, according to police; the figure 12,000 was reported by protest organizers. As this goes to press, Me Aïssata Tall Sall is taking part in the protest in Florence, to pay tribute to the memory of the two murdered Senegalese men, with the expected presence of the Italian Prime Minister, the President of the Regional Council, the Democratic Party leader (major opposition to the current governing party). The lawyer hired by the Socialist Senegalese party will head up a pool of French and American lawyers who will defend the victims. Tomorrow, December 18th, before leaving Italy, she is scheduled to meet with other Italian lawyers who will also join the pool. The Italian authorities reacted with strong statements and actions to the tragedy, as did the Senegalese community and Italian civil society.